Challenge: Student was travelling overseas and wanted to create a tool to show family members about where he lived in New Zealand. Having experience with 3D Printers he thought that it would be an excellent tool to showcase a creative map of New Zealand. Background: Student has been involved in producing 3D Prints of a significant level over the last two years, some of which have been of significant detail (such as the drone iPad stand). With this print the project the student had identified having produced this map he would then mount it on a wooden base. This lent itself to the idea that if we were studying a particular country or area we could produce a map of that area and incorperate it as a learning aide (as it is 3D Printed for Juniors it could be particularly robust, and used repeatedly) or produce a 3D layered piece of art. 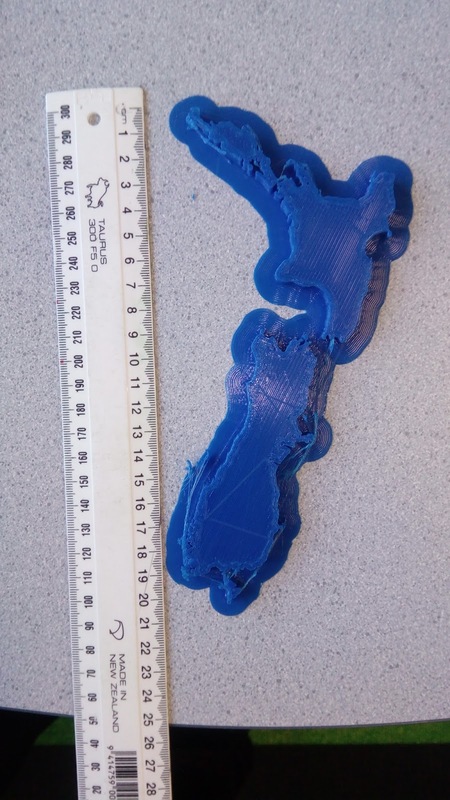 The student did not create the map of New Zealand himself, he simply sourced it from the free material online on Tinkercad, and adjusted the width of it to meet the needs of the project that he had in mind. Level of Difficulty: Low - the student had the project in mind and sought the particular print that meet its needs. Following this it was simply a matter of determining the width of the print, to meet the needs of the design that he had in mind (in this case mounting the print on wood, which is easily done by either wood glue or superglue). Timeframe: With the standard default settings provided by the Ultimaker2+ Printer and the width of the print, the total print time was three hours. This produced a print that was thick enough for mounting, if it was intended as a jigsaw piece or something more robust then the print time that would be require would obviously fit that. Size: As clearly showin the the photograph the print had a length of 210mm and a width of 120mm. The width of the print itself was 5mm. What we would do differently: For this particular print and the aim of the project, it met the needs and requirements of the student, so minimal. Next steps for students: Considering other ways the 3D Printer in this case could be used in conjunction with other tools to make an object, for instance in combination with a laser cutter we could back this map onto wood and make an excellent teaching aide, or conceivably a jigsaw.